As some of you know, we have a sister site called TalkShoes that’s all about…well, you guys are smart. Designer bags and designer shoes go together like peanut butter and jelly (and maybe even better, because hey, fewer calories), so it only seemed right for us to head in that direction. Now that we’re in the shoe business, we thought we’d combine the two once a week for your pleasure in our new Perfect Pairs series. Perhaps because of the business I’m in, I always start thinking about my outfits with bags and shoes. There’s usually a bag I’m jonesing to carry or a pair of shoes that I think would be perfect for a particular occasion, and if I’m lucky, the bag and the shoes both look like they might even belong in the same outfit. (That’s not always the case, though, and then some tough decisions need to be made.) Creating unique combinations is the basis of personal style, though, which is why I tend to shy away from buying shoes and bags that already look like they go together, particularly if they’re form the same designer. It’s the accessory equivalent of buying and wearing a full runway look, and that’s just not what gets me excited about style. It would be tempting to pair a gold shoe with a gold clutch for an evening out, but I was impressed at the way the strap-and-mesh construction of the Robert Clergerie Querrye Sandals reminded me of the wing structure of a butterfly or dragonfly. 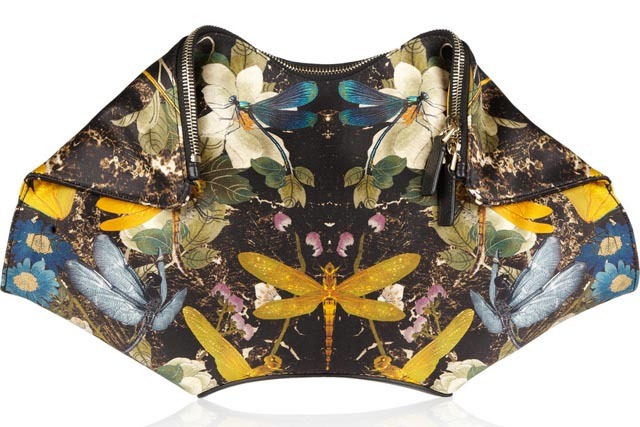 When I saw the dragonfly print and gold tones of the Alexander McQueen DeManta Silk-Satin Clutch, it was clear that the two were a match made in accessories heaven. They don’t “match,” but they do coordinate, and I think that’s a much more stylish goal. Do you like these pieces together? Don’t forget to check out all of our favorite shoes at TalkShoes.com!